paper.love.chronicles | my life. decorated with paper. Posted on 9 December, 2016 by tina f.
Another day, another entry into an A Cherry On Top Challenge! I did the December “Rewind” Challenge today which allows you to pick any challenge from November. I chose the November “Three in a Row” Challenge with the criteria of using a Project Life card, circles, and three or more descriptive words. The descriptive words are “favorite”, “totally” ,and “happy”. This is one of the favorite layouts I completed in a long time. I like the simplicity in small details on this page. I’m still using the Studio Calico March 2015 “Odyssey” kit with items from my stash. I’ve only been making one page per day since I have a lot going on right now despite being on maternity leave. We’re currently remodeling our master bathroom. It’s been 4 months since that project started, and it’s still not complete. We’re not even DIYing it! I can safely say I will NOT be using these contractors again for future projects. We also need to set up the baby room. We don’t have any of the furniture or crib in place yet. I actually had a labor scare last night with what felt like contractions for a couple of hours. There was a lot of tightening and some pain in the lower abdomen area. Thank goodness it went away because I’m only 34 weeks pregnant right now. On top of all that, I still have general cleaning projects and things to take care of for my husband and I’s side business. One thing at a time. That’s all I can do! Posted on 25 November, 2016 by tina f.
It seems the only time I’m inspired to post anything on this blog is when I’m making pages for Shimelle classes! As it goes, I’ve been taking Shimelle’s newest class called “Design Decisions”. The class is 2/3 of the way done, and I’ve finally made my first layout for it! It’s not that I haven’t been scrapbooking–I’ve just been more on a divided page protector and mini album kick than 12×12 layouts. I’m going on maternity leave in a week and a half, and you better bet I’ll be back to scrapbooking on a near daily basis again (yes!). Well, enough chit chat. Here’s my simple layout inspired by Shimelle’s sketch. I kept the basic design elements of the sketch for my page, but I’ve also deterred from the sketch quite a bit (as I’m known to do). This page has fewer embellishments than my usual amount. I didn’t want to go overboard since the background paper is quite busy. I was debating whether or not to add some mist but decided against it in the end. This will just be one of the rare, super clean pages in my album. 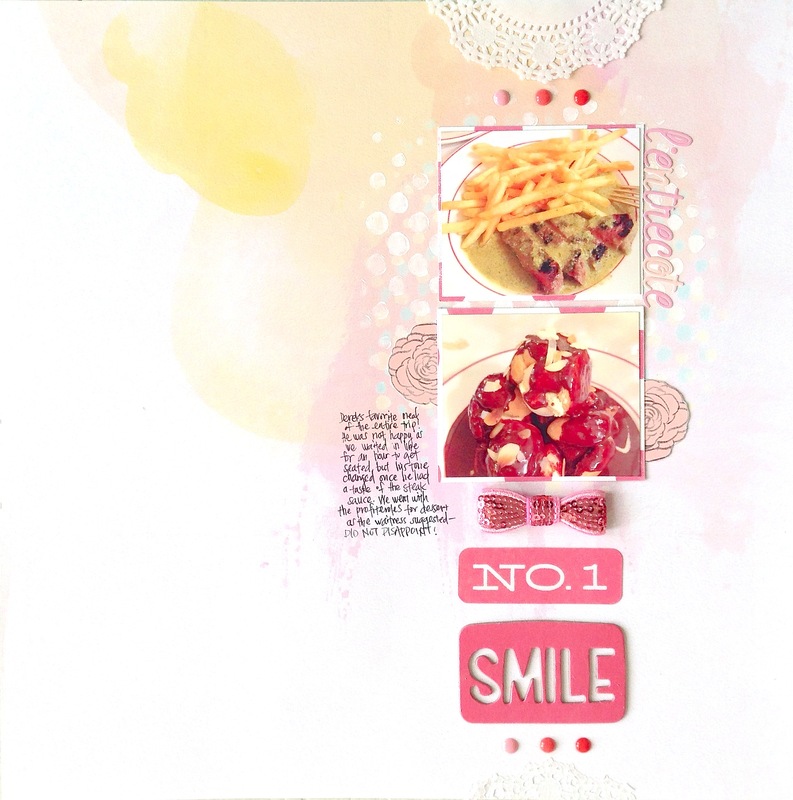 Posted on 11 August, 2016 by tina f.
Here’s layout #3 from Shimelle’s most recent class. Oh boy, did I go all out on this 12×12 page! Not only did I use stamps, involve my Silhouette Cameo, and used up some scraps, but I even managed to add some hand stitching! This was actually quite a fun layout to make. I’ve only used my Silhouette a couple of times before for scrapbooking even though I’ve owned the machine for 2.5 years now. Before you chastise me, I did make use of the electronic die cutter for other projects including the “thank you” notes for my wedding. If you’re wondering where I used the Silhouette on this layout, I used it to die cut a stencil for the title. The scraps are from very old Simple Stories and Amy Tangerine papers. The hand stitching was creating using a stencil also from Amy Tangerine that’s at least a couple of years old. The title makes it pretty obvious, but this page is about my first Hobonichi. I got into the planner craze in 2014, but I haven’t been able to keep up with daily journaling or even simple checklists. I’ve tried ring-bound planners (Filofax, Kikki-K), book bound planners (Hobonichi, traveler’s notebook), and bullet journaling in a Leuchtturm notebook. Nothing stuck…I think I’m too lazy. That doesn’t mean I won’t give it another go because it’s still a lot of fun (albeit quite a waste of money). Anyone out there with tips on daily planning/journaling? I’d love to hear some ideas! Posted on 16 March, 2014 by tina f.
I’m really enjoying the oh so popular watercolor look right now. The soft muted colors are just absolutely beautiful. However, I don’t have very many watercolors, and it can get a little messy. I took advantage of the premade watercolor look on the patterned paper from Pink Paislee’s “Color Wash” collection to achieve a hand-painted effect without all the trouble. I used a circle stencil with different colors of chalk ink behind the photo. Various pink embellishments from my stash were used to create a column on the page. The chipboard stickers are from Amy Tangerine while the sequin bow and enamel dots are from Freckled Fawn. The photos are taken from Le Relais de l’Entrecote in Paris, a restaurant I found through TripAdvisor. We walked there from Rue de Champs Elysees after circling the underground network around the Arc de Triomphe. The line outside wrapped halfway through the block even on a cold winter night. The fiancé was barely able to endure the hour-long wait to be seated. Once inside, though, the food comes quickly. The restaurant has a set menu of salad and steak frites plus an option for a variety of desserts. I loved the simple and fresh salad. The fiancé loved the mustard herb sauce that accompanied the steak frites, so much so he wanted to eat there again the next day (didn’t happen though). The steak itself is definitely not the best cut of beef and is minuscule in size compared to US standards, but it was good enough where we finished two helpings each. The standout of the night for me were the chocolate profiteroles for dessert–so so so good. Hands down, the best dessert I’ve had in a while.